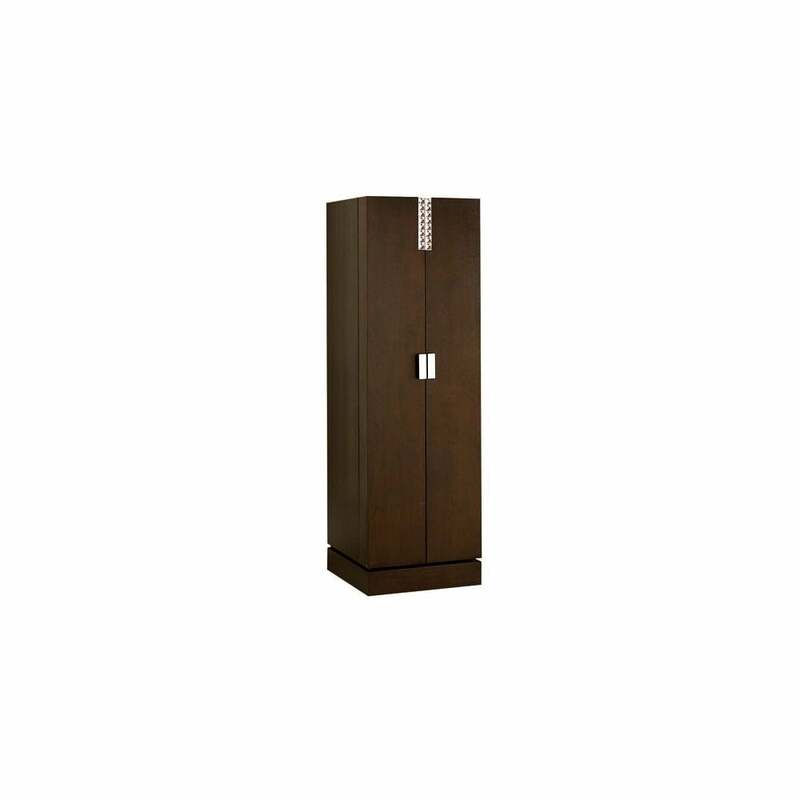 The Solitaire Bar cabinet provides the absolute luxury of an at-home bar experience. This is an impressive unit for both style and function, designed perfectly with optimum storage and display purposes in mind. The 2 doors each have 4 adjustable wooden shelves and 5 insertable chrome metal railings. The central section has 1 small and 2 large drawers with full extension. There is 1 wooden sliding shelf with smoked glass platter on metal rods, along with 1 fixed methacrylate shelf for glasses. The central section houses the bar compartment with a stunning smoked glass mirrored back wall. The 2 large drawers are equipped with a bottle holder for 6 bottles, the small drawer is equipped with 1 drawer insert with 2 niches. The bottom inserts of each of the drawers are covered with imitation leather and divided by beech inserts sealed with transparent lacquer. The stunning beechwood cherry veneered frame is complimented with decorative inlays, a beautiful design feature with echoes of the elegance and sophistication of Art Deco styling. You can customise you cabinet with a choice of either Swarovski elements or mother of pearl decorative inlay. The unit comes with base adjusters to compensate for uneven flooring. Priced for Swarovski Elements with Sahara, Cohiba or Blazer woods, other options available.